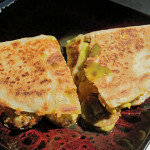 I used Taylor's Ultimate Mild Jalapeno on this breakfast quesadilla and really enjoyed it. In a bowl, beat the egg until blended. Mix in the chopped sausage. Scramble the egg and sausage in a skillet. Place the tortilla in a skillet, flat. Heat the skillet on medium. Sprinkle the cheese over one half, then top with the egg and sausage. Fold the empty half of the tortilla over the other half. Flip the quesadilla once the underside is browned. Let it cook 2-3 minutes. Remove the quesadilla from the skillet, slice it in half, and chow down.